Anu Samtani on ‘WHY should you go for Kuch Bhi Ho Sakta Hai’! Some stories are best read...some best told...but the real stories are heard..! You don't want to miss this Singapore, as Anupam Kher tells you all there is to know about his life & success, failures & struggles ! We promise, you will back home with a lot more than just a picture with Mr. Kher..! Come May 29th & be a part of Anupam Kher's journey..It will leave you inspired.! 7 pm @ University Cultural Center NUS UCC Tickets http://www.sistic.com.sg/events/ckucch0516 Get your discounts ..10% Master card & 15% Corporate Group discounts..! Have you seen ‘Kuch Bhi Ho Sakta Hai..!’ We Want to talk to you..! Lets Think Aloud is proud to be associated with 'Kuch Bhi Ho Sakta Hai'!!!! Seen the play in India, Singapore or any other part of the world? Well; send us a msg on teamthinkaloud@gmail.com OR PM us here or on Facebook now & we would love to have a quick chat with you..! 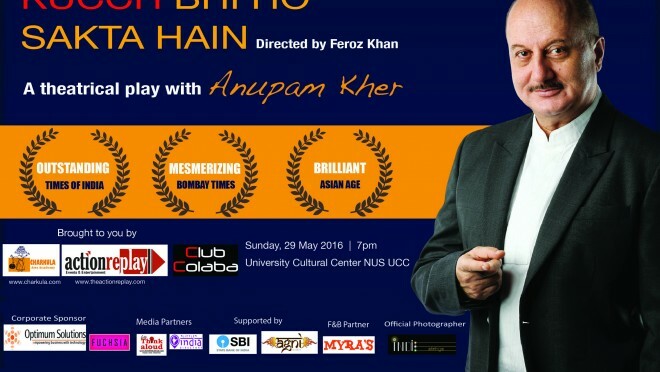 Get your tickets to the play with Anupam Kher (you do not want to miss him in this; trust you me) and see you on Sun, 29 May 2016, 7pm @ University Cultural Centre Hall, NUS For tickets: http://www.sistic.com.sg/events/ckucch0516 Get your 10% discount today..!